Scarce highly detailed English language Japanese map of Tokyo published for travelers to the Tsukiji Foreign Settlement. New Map of Tokio Divided into Ninth Ri Sections for Measuring Distances. A scarce 1886 Meiji 19 English language map of Tokyo, Japan, issued by M. Nishinomiya and G. Nakamura. Prepared and published for foreign travelers, missionaries, diplomats, and businessmen living in the Tsukiji Foreign Settlement, this remarkable map follows established Japanese cartography for the city with the remarkable difference that it is printed in English. Like most Meiji Era (and earlier) maps of Tokyo, the present example is oriented to the northwest. Centered on the Chiyoda District, this map covers central Tokyo from modern day Meguro to Kita and from Shinjuku and Shibuya to Koto. It is bounded in the lower left quadrant by the docks and piers giving access to Edo or Tokyo Bay. Like most Japanese maps of this period, but to our knowledge no English language or European maps, it covers the city in extraordinary detail, naming each street, block, park, canal, pond, and government building throughout. 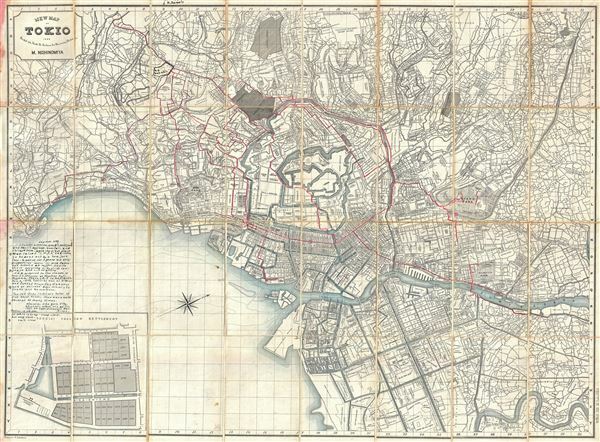 To our knowledge, this is the only 19th century Japanese published map of Tokyo to appear in English. As such it is an invaluable tool for non-Japanese speaking scholars researching Meiji Era Tokyo. A large inset in the lower left quadrant focuses on the Tsukiji Foreign Settlement. From 1852, when Commodore Perry arrived in his 'Black Ships' forcing the Tokugawa Shogun to sign the 1854 Kanagawa Treaty (also known as the 'Unequal Treaty'), various concessions and foreign settlements began to appear throughout Japan. Most specifically these appeared in the cities of Nagasaki, Kobe, Yokohama, and of course Edo or Tokyo. The Tokyo foreign concession was called Tsukiji, a stretch of reclaimed land build upon a network of canals and bridges near the harbor. Foreign missionaries, scholars, politicians, and businessmen were required to live within the concessions and confine themselves to restricted routes when traveling within Tokyo proper. Though initially unpopular, the concessions appealed the Japanese fascination with all things foreign and had a significant influence on the national modernization projections associated with the Meiji Restoration. The Kanagawa Treaty was repealed in 1899, allowing foreigners to roam freely throughout Tokyo and the foreign concessions gradually diminished. In 1923, following the Great Kanto Earthquake, Tsukiji became the site of the Tokyo Fish Market, today the world's largest (and probably cleanest) piscine marketplace. F. H Bassett U. of Minn. with J.T. Swift, Yale, and Rev C. T. Wyckoff, Knox Coll. And Chicago Sem. Were the first group of so-called Y.M.C.A. teachers to be sent out by a New York Com. To serve for 3 years as self-supporting men in such Japanese schools as might desire their services in English Language and Literature. F.H.B. supplied in the classes of Prof. J. O. Spencer at Goucher Hall, Aoyama, Tokio (D-9 on Map) Mch to June 1888. Later he was at Hikone and Osaka (Jinjo Chu Gakkos) and at private Boys Schools in Osaka and Kumamoto. The Red Lines indicate trips of F. H. B. about Tokio. Some were made several or many times. 1931 at 3330 Delavall Ave, Bronx. 45 years is a long-front view - but very short tail view. Bassett was part of the American Board Mission in Japan the remarkable story of which is available in Gordon Lafayette's 1901 book, Thirty Eventful Years. The American Board Mission, which started in 1873, was the first major Christian missionary effort in Japan and had a lasting impact on Christianity throughout the country. This map was published by M. Nishinomiya and engraved by G. Nakamura. This map most have been fairly popular amongst English speaking missionaries, merchants, and diplomats living in the Tsukiji Foreign Settlement, for whom it was issued as it went through several editions, most with different publishers. The earliest example we are aware of was issued by M. Yamatoya in 1882. Other editions include a 1884 Nishinomiya example, the present 1886 example, and one published by H.M.Co. held at Harvard's Pusey Library and dated 1893. Very good. Manuscript annotation. Dissected and mounted on linen in 24 panels. Attached to original red linen boards which bear Mr. Bassett's personal bookplate. Some minor margin stains upper left quadrant do not affect printed area.